You will cut 4 – 5” wide strips from each fat quarter, along the selvage. You will have four stacks of 12 different fabric strips. The fabrics must be in the same order in each stack. Sew all twelve strips together along one long side of the 5” wide strip. You can sort them in a pleasing manner before you start, but, all four stacks must remain in the same order. Press all seams in the same direction on each strip set. When done you will have four strip sets of 12 joined strips the unit will measure about 18” wide (US) 20” wide (CDN) and 55” long. Sew each unit into a tube by sewing the long side of strip number one to the long edge of strip number twelve. Press that seam in the same direction as the other seams. Make a total of four tubes. 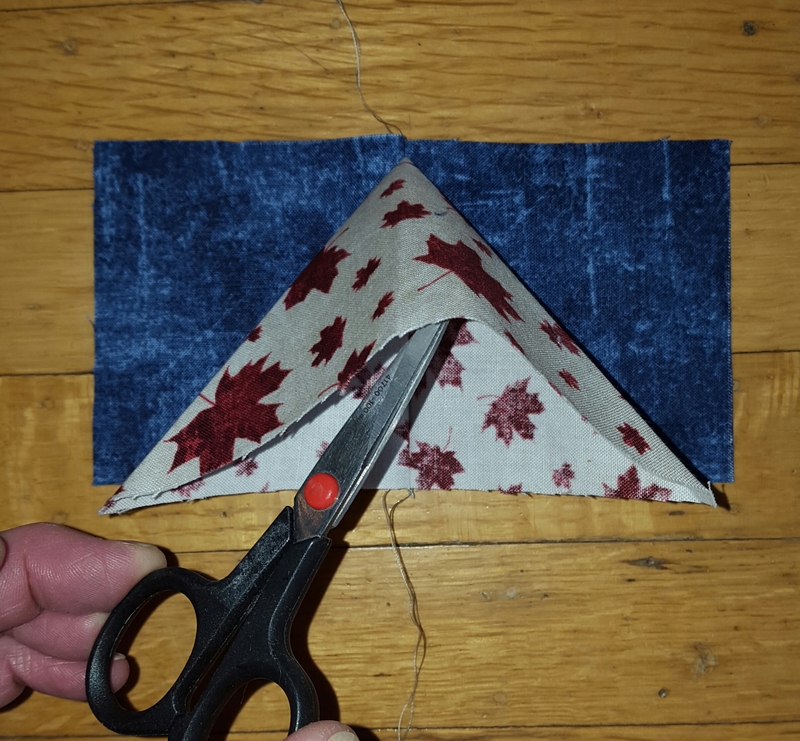 Lay one unit on your cutting mat, right side out, smooth and straight. Without too much waste trim one side to square it up. From the square up side cut 2 ½” wide strips for a total of seven strips. ( Save the excess for another project!) Keep in a neat pile. Do the same with three remaining tubes. You have 4 stacks of 7 strip sets. Working with one stack at a time, lay out the seven strip sets side by side. At the top of strip #1, designate a fabric as the first fabric. At the top of strip #2 fold the first fabric in half. At the strip #3 will have the second fabric’s seam at the top. At the strip #4 will have the second fabric folded in half. At the strip #5 will have the third fabric’s seam at the top. Continue laying out all the remaining strips sets side by side #8, #9 through #28. Use painter’s tape to number the strips 1 – 28. Sew all 28 strips together making sure that the seams of one strip is centered in the middle of the rectangle beside it. Use a few pins, start pinning from the end of the seam. This way you will end with the seams even. Add a narrow inner border (1.5″ cut)and an outer border (5″ cut) You are done. Now quilt it! 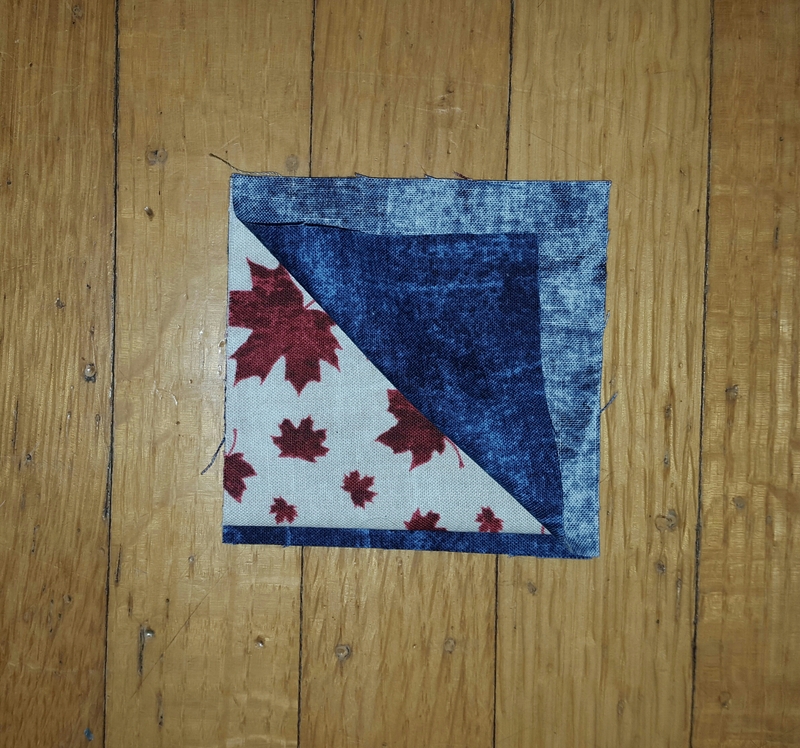 Baby Quilt – 5 Fat Quarters – Lay the 5 fat quarters on top of each other, selvages even. Trim off selvages. Cut into 2.5” strips along the selvage edge. You will have stacks of five different fabric, 2.5” wide by 19.5”. You will have one stack remaining. From this stack you will cut extra 2.5”x 2.5” squares as needed. Don’t cut the whole pile into 2.5” squares immediately, in case you make a mistake later and require a larger piece. Sort all cut pieces into piles of 2.5” squares, 4.5” rectangles and 6.5” rectangles. Keep families together, don’t mix up. Select a square of one print and stitch a 2.5” (different) piece to one side. Add a 4.5” piece to both long sides. Add a 6.5” piece to the remaining side. You will have a different fabric in the center, with another (different) fabric all the way around to create a “Once around the Square” Block. You will make 35 blocks. Place the 35 blocks in seven rows of five across, random or in diagonal rows sorted by colour, as you please. Two fat quarters. Trim both fat quarters to same size, about 18” wide and 20” tall. Use the “French Seam” method to clean finish the side seams and bottom seam the same way as for the Easy Pillowcase. Make two straps. I used 2-4” wide strips, pressed in half, wrong sides together. Next, open up the fold and press, towards center, 1” along both sides. The two long raw edges will meet at center. Press along the center fold again. You will have two 1” wide straps. Top stitch with “Straight Stretch Stitch” set at a length of 3.5 – 4mm. Cut straps to your desired length, baste to raw edge at top of bag. Press to wrong side ¼” and another 1” to 1.5” Top stitch with same stitch as for straps. Miter bottom corners of bag if desired. Machine is clean, insert new needle such as a size 70 or 80 microtex. Thread the machine with Aurifil 50wt thread, it is super fine and strong, full bobbin, lasts longer and your seams will press flatter. Choose a neutral colour that will work with all your fabric colours. Let’s go! You already know how to sew and understand the basic rules of sewing. 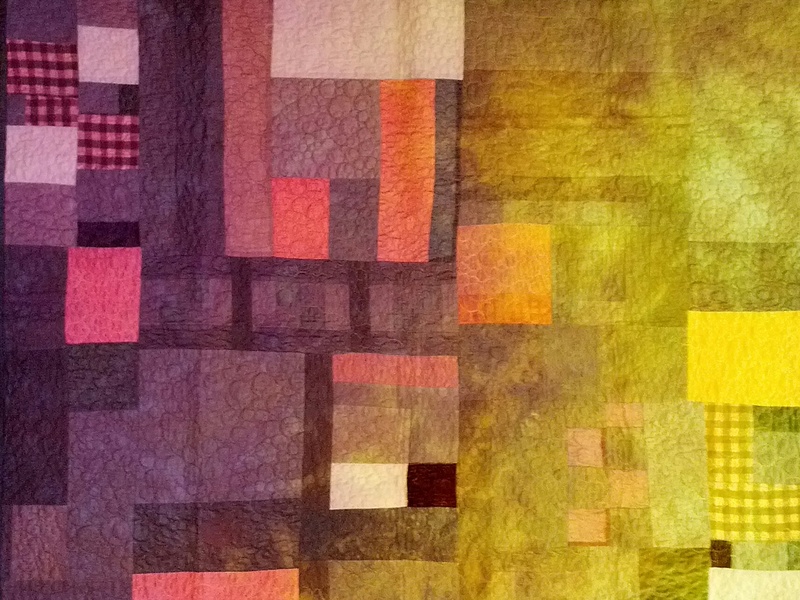 With improvisational patchwork “accuracy” is not important. You are not following a pattern, the patches need not match up or measure up to a designers instructions, sooo…….. ¼” seams are not required but not frowned upon. 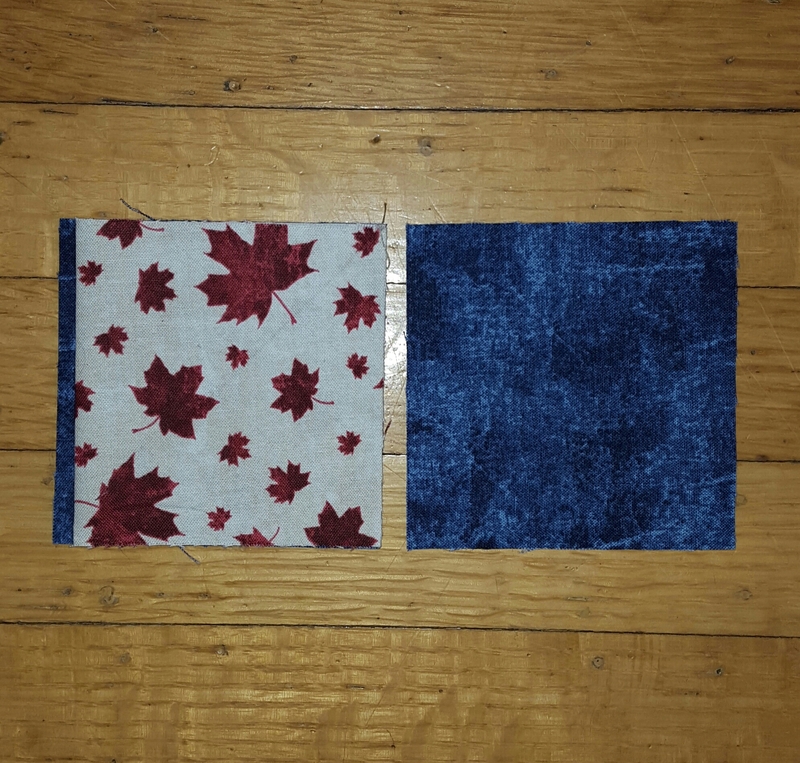 Grab two pieces of similar sized fabrics and stitch them together. Your first pair! Grab two more pieces of fabric, stitch. Repeat, make a pile. Time to get up and stretch, head over to the ironing board and press the pairs open, as you would usually do. Consider each pair the start of a block. How many blocks? How big will each block be when finished? 8” or 20”? The smaller the block the more blocks you will need. Make 9, 12, 20 blocks. You get the idea. Set your pairs beside the sewing machine. Pick a third piece of fabric and stitch it along one side, any side, you are the designer. At this point you can start making “rules” or we should really call them “the steps in YOUR design”. At any time you can hang the blocks on a design board, step back and ponder about what you see. Look for the flow of the design, do you like it, move it around, rotate, play. At some point you will want to stop making each block bigger. Now is the time to start compiling all the blocks into one piece. 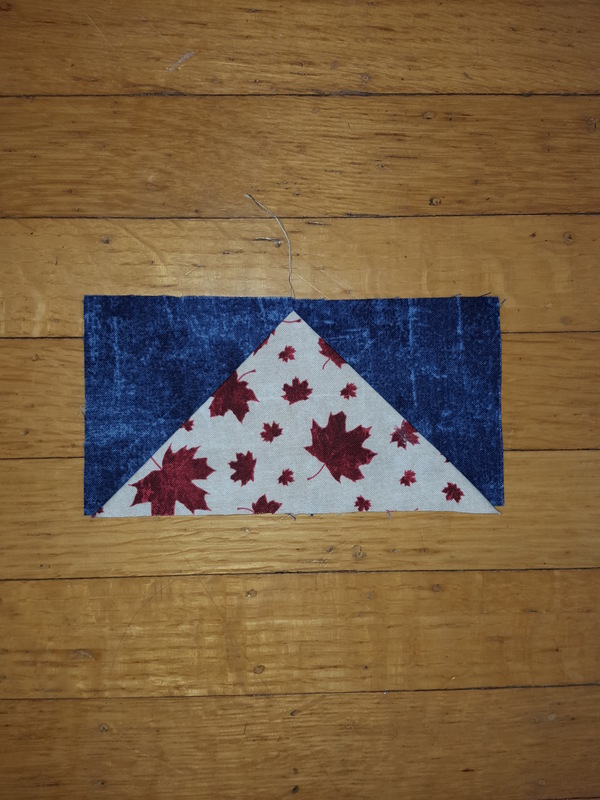 Simply sew two blocks together, trimming after stitching. If a block is too small to fit, make it bigger. Too big? Trim. 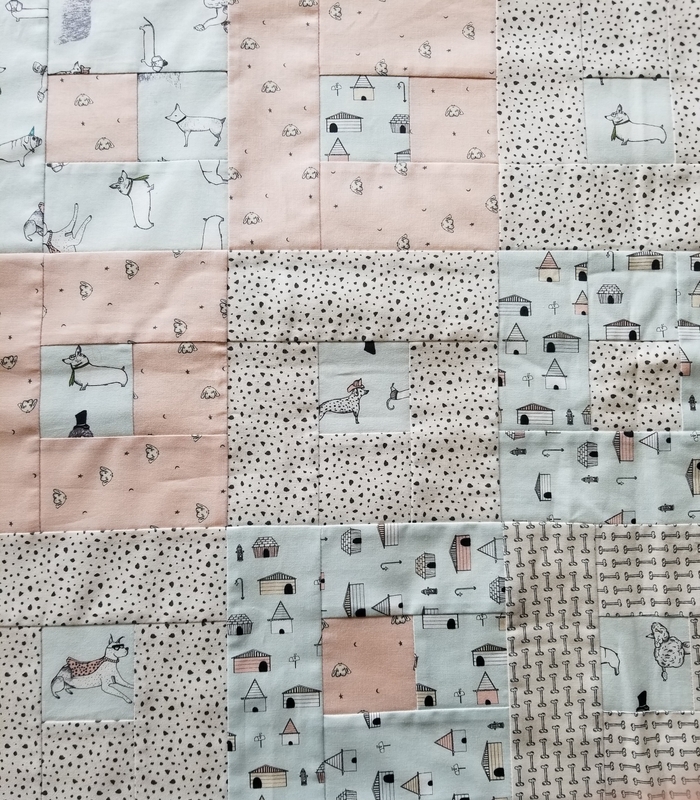 Cut one or two blocks into parts, rearrange and stitch together with each other or take a piece and start another block! Cotton, linen, cotton, rayon, silk, hemp, cotton/linen blends, flax, velvets & jaquards. New fabrics, vintage linens and antique laces & doilies. With bobbins wound with white Aurifil 100% Egyptian cotton thread. “Just sew scraps together,” the teacher said. “Just do it! 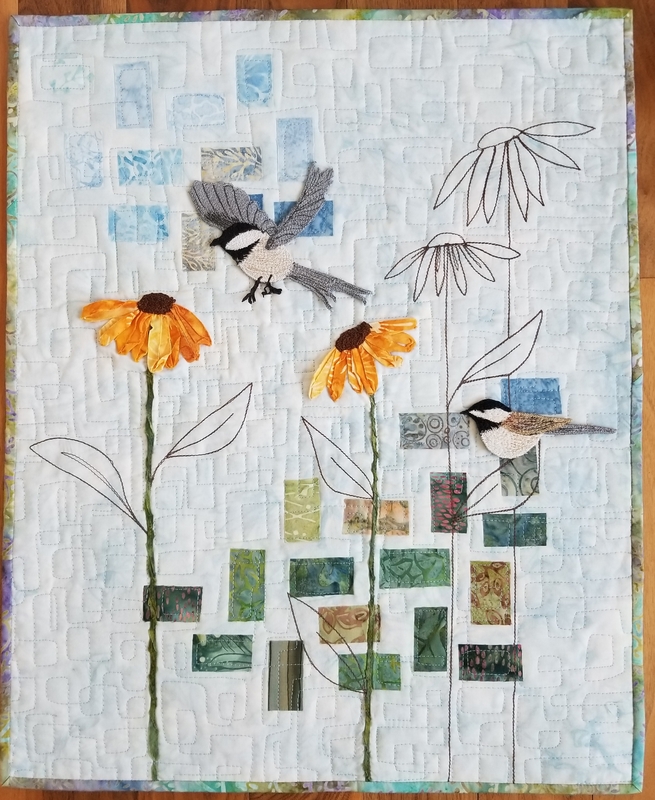 Add a scrap, add a square, add a strip,” suddenly a quilt block is done. “Make another block” said the teacher. And another, more, more, more. Square up the blocks, join the blocks. In no time we had a quilt top ready to……………….Dye! Knowledge of dyeing was not a requirement in this class. The simple steps were explained, but the dye mixing was left to Carola’s daughter Alaina. The students were here to enjoy the process of sewing and see the results of their own colour choices in their beautiful dyed quilt tops. 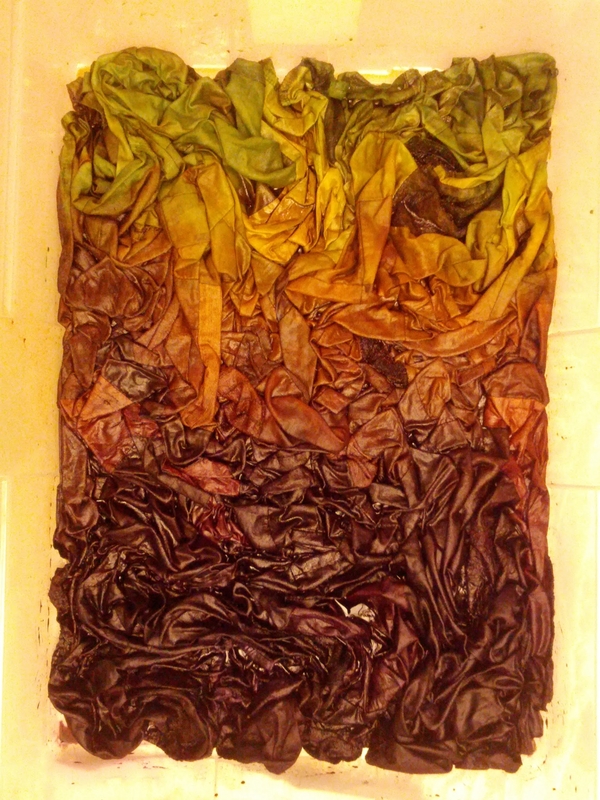 Above is Carola’s quilt top soaking in the Procion Dye tub, a shallow plastic tub about 18″ x 24″ After 15 minutes of steeping in the dye, soda ash solution is added. All in all, very little water is used in this process. Only one hour later the quilt top is ready to be rinsed. “Rinse until the water runs clear” Carola said. 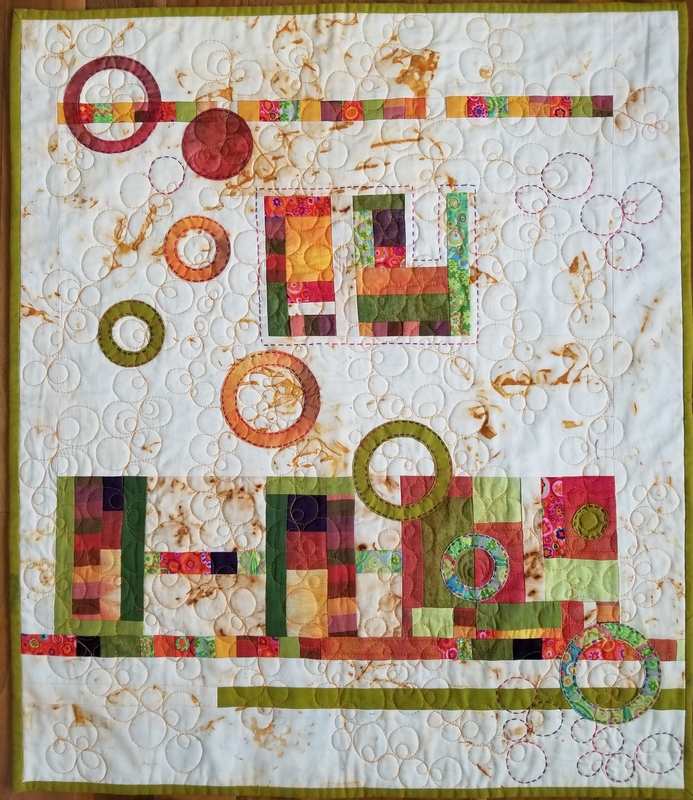 Finally, here is Carola’s hand dyed quilt top. All the different fabrics took the dye in different ways. It is all the twists and turns in the whole process that makes Improvisation Patchwork such a fun, inspiring and uplifting experience! The sewing machine is your pencil, the fabric is your paper, let’s draw! 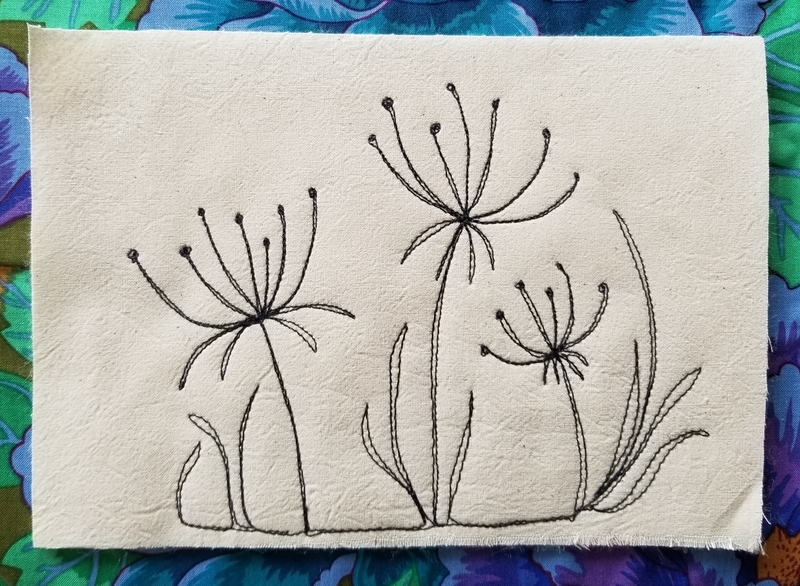 Doodling and drawing is mainly a “free motion” sewing technique. However, you can also do many parts of your straight line work such as a flower stem, with the feed dogs engaged. Always practice your doodling before you make a big project. You will be more confident, you will have sorted out any issues such as bad tension, needle type/size/age and thread colours. Approach doodling with your sewing machine with the attitude of a five year old being asked by the teacher to draw pictures. Although your work may initially look like a scribbly mess, they will become “works of art” with practice. In other words, enjoy yourself and don’t be critical of your work, you are on the path to awesome success! Attach the extension table to the machine. This is a must. Your left hand will now have a surface to work on. If you are quilting with the machine dropped down in a cabinet, you will not need an extension table. Wear Quilting Gloves. They give you a firm grip on the fabric and you will be able to move it without your hands slipping. This will give you the control to achieve an even stitch length! Insert a new needle, size 80/12 or 90/14. Choose a sharp needle such as a Microtex, jeans or a quilting needle. Change to a new needle every few hours of sewing. Or, choose the needle that works best for you, but change it often. 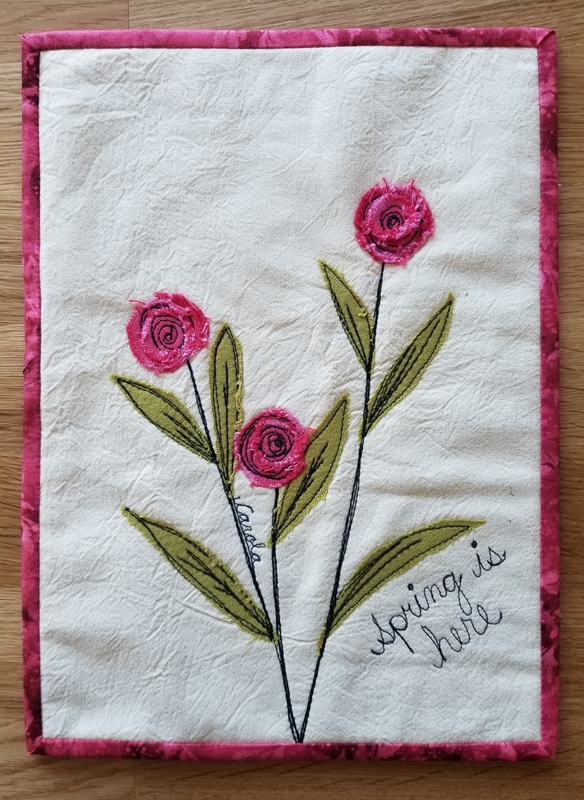 I use Aurifil Mako Cotton Thread for Doodling. In the needle, 28 weight is thick and really shows off the stitching! In the bobbin I use 50 weight, a very fine thread. You won’t be changing bobbins as often. Select the needle down function. This keeps the needle in the last stitch whenever you need to pause. When you start to sew, moving the fabric, sew only in the area between your two hands. Do not sew in the space above or below your hands. Instead, stop, re-position your hands and continue stitching. I envision my two hands on the fabric as an embroidery hoop, clamped down on the fabric. Stitch “in the hoop”, when done, re-position “the hoop” and continue sewing. Draw your design with a pencil on paper. This is good practise for warming up and not wasting fabric and thread, saves you from using the seam ripper. Doodle! Prewash fabric to shrink the fibers. This is optional, but a good suggestion for some fabrics as they may be washed later. Stabilize the fabric to give it a “backbone.” Stitching on single layers of fabric may cause puckering and shrinkage. Stabilizers are a must. Choose either a tear-away stabilizer or my favourite: thin batting (I’m a quilter) Even a second layer of fabric can be considered a stabilizer. Attaching the fabric in a sewing machine embroidery hoop is also an option, to eliminate puckering and help in handling the fabric. Test the upper and lower tensions on your machine. Too tight tensions will pucker the fabric. If the tension is too tight it will manifest itself later, especially after washing. Writing words: Mark lines the same as in your grade two exercise book. You remember! My favourite way to stabilize my fabric is to use thin batting, which will remain in my project. Other ways to stabilize the fabric is with a tear-away temporary stabilizer, starch or even an embroidery hoop designed for use in sewing machines. My favourite way of sketching a design such as a dog, poppy, bird etc. is to google “How to draw a_______. There are lots of on line drawing tutorials that show the steps, tricks and secrets of how to draw anything! Who knew it could be so easy! Trim all the BATIK charm squares into 5” squares. They may be slightly larger or irregular. Stitch a 2 ½” BATIK strip to one side of a 5” square. Press seams toward the strip & trim excess strip. Using the same strip, stitch to the second side. Press the seam towards the strip and trim excess. 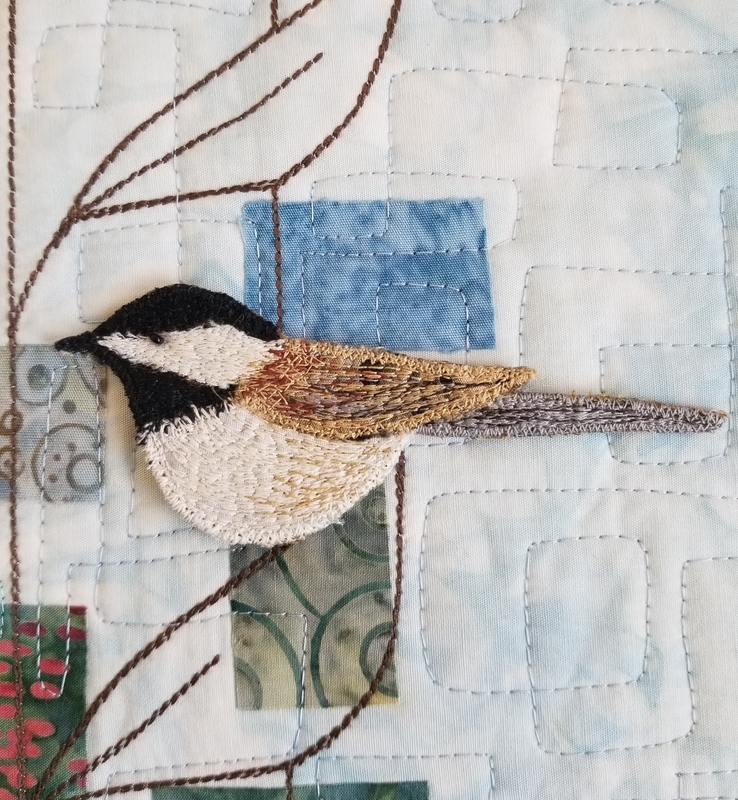 Using the same strip and stitch to the third side. Press the seam towards the strip and trim excess. Using the same strip and stitch to the fourth, last side. Press the seam towards the strip and trim excess. Continue in this manner until you have stitched a strip to all four sides of each of the 35 – 5” blocks. You will now have 35 – 9” blocks. If your blocks are slightly larger or smaller, that is not a problem, as long as they are all square & same size. Trim all 35 blocks to the same size. Layout the 35 blocks, 5 across and 7 down. Move them around until you are satisfied that the colours are evenly distributed. Add the inner border: Cut 6 – 1 ½” wide strips from the inner border fabric. Sew the inner border strip to the short sides first (top & bottom), long sides second. Press seams to the inner border strip. 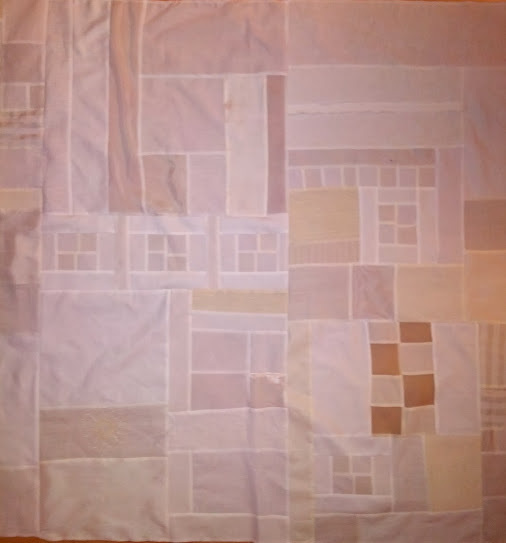 There are 31 “keys” in the 70” sides of the quilt and 22 “keys” in the 54” sides of the quilt. Stitch a “31 key” border unit to both long sides of the quilt top first. 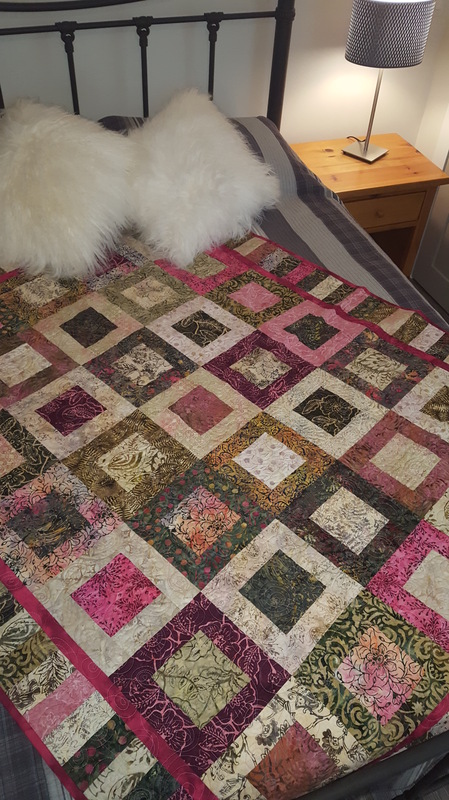 Tip: If the “31 key or the 22 key” border units are not the same measurement as the top, bottom or sides of the quilt top, open some of the seams between the keys and sew them again using a smaller or larger seam allowance. Stitch a 5” charm square to each end of both the “22 key” border unit. These 5” squares will be the border cornerstones. Press the border seams towards the borders. The binding is made from 6 – 2 ½” wide strips. 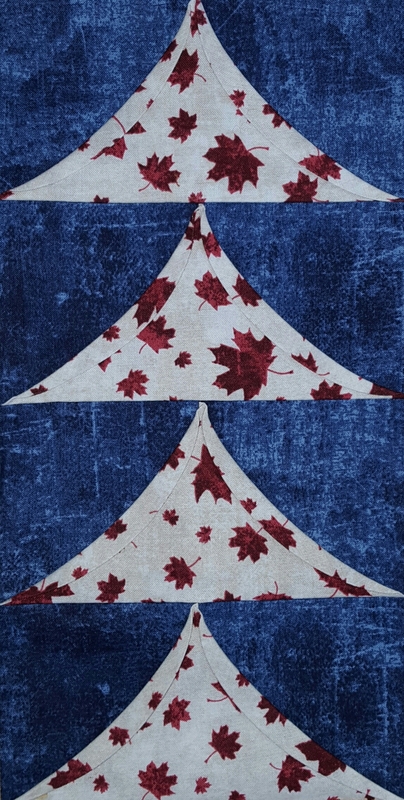 Below is a list of the Top Tips for Successful Free Motion Quilting. Applying ALL the tips at the same time is the real secret for success. Sew Slip- Free Motion Slider: A slippery sheet to cover the bed of the sewing machine. The “Sew Slip” has a non-stick top surface which is bonded to cured silicone. The tacky back holds the “Sew Slip” to your machines surface. “SewSlip” eliminates the drag on your free-motion sewing and quilting projects. Best of all, you don’t need to tape the “SewSlip” down to have it stay where you put it. 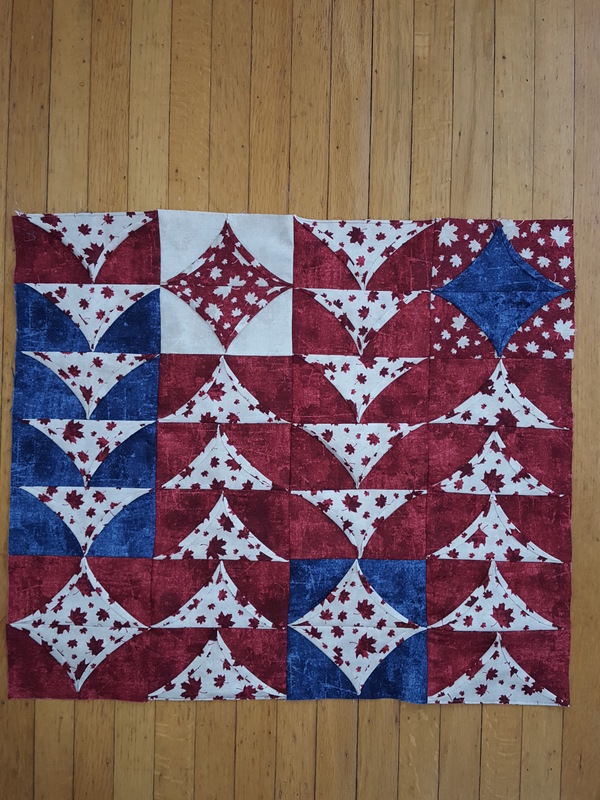 The backing and batting should be at least 2” larger all around the outside of the quilt. This will give your hands something to grip. If there is little or no extra batting and backing, you will not be able to do your best stitching around the outside edges of your quilt. Your frame of mind: If you are a novice, take on this new experience like a five year old kindergartener. Be excited, and proud of every stitch. Be proud of every scribble, as you progress, your scribbles will become calligraphy! Have fun, no negative thoughts allowed! The machine should sew at about ¾ speed, quite fast. (This can be set on the speed control slider or button) Your hands however should move the quilt at a slightly slower, steady speed. Never let go of the quilt while you are sewing. Don’t lift your hand(s) of the quilt while the needle is going up and down. Never rotate the quilt while you are stitching. 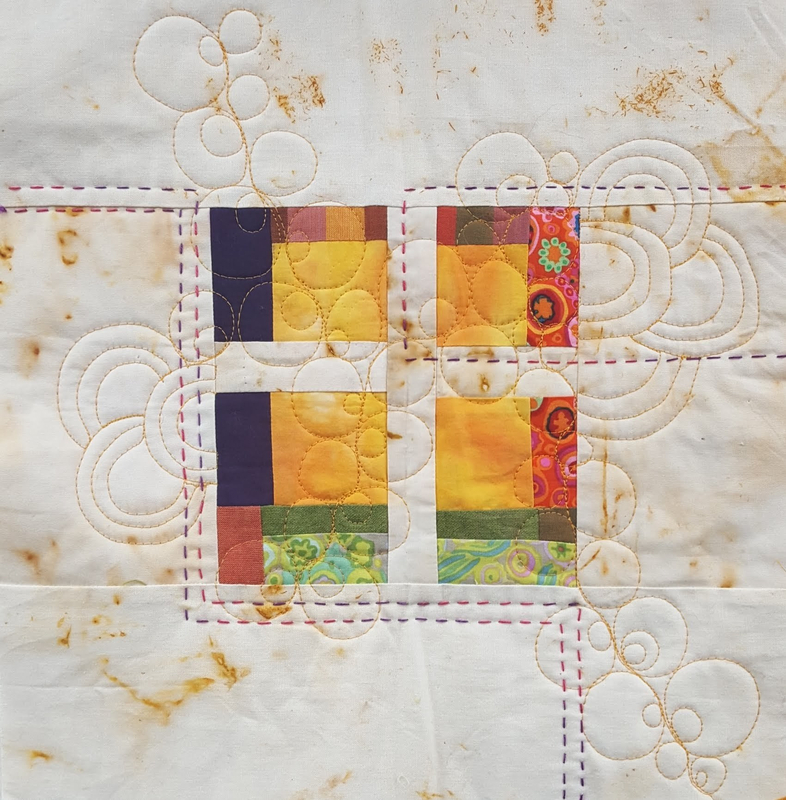 Although you may be practising on a small piece and you see no reason why you shouldn’t rotate the fabric, keep in mind, once you have a large quilt in your machine YOU WILL NOT BE ABLE TO ROTATE THE QUILT WHILE STITCHING. So don’t develop a habit that will make you feel uncomfortable and awkward. Tackling a very large quilt in a very small machine: Start at the center of the quilt and stitch towards the right only. Give the quilt a ¼ turn and start back at the center. Repeat a total of four times until you have the center 2/3 of the quilt done. Then quilt the outside perimeter of the quilt in a clockwise manner. 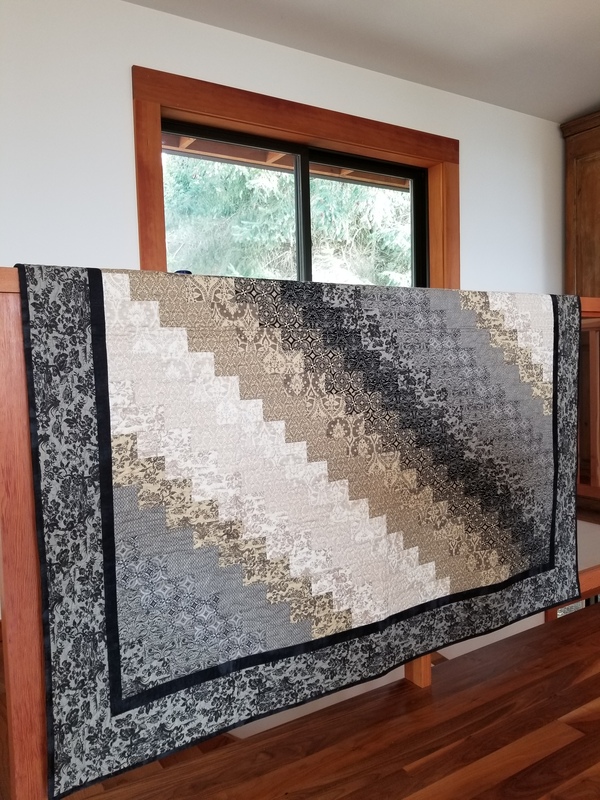 More on the subject of speed: When Quilting to a point or around a corner of a quilting motif such as a star or a flower, do not slow down your speed. How fast you move the quilt compared to how fast you are stitching should not vary. If you do, the machine will place several extra stitches at the point of a star or as you slow down for the curve. This is manifested on the underside, looking like mini French knots of the top thread! This tip is for those of you who have an older machine. Always remember to put the presser foot down. Every time you stop or pause your quilting, your right hand reaches to lift the presser foot. It is an automatic reaction. When you resume quilting, you may forget to put the presser foot down. Why? #1 you may not remember putting the foot up and #2 the foot looks like it is still DOWN because of the loft of the quilt under the foot. Why is this important? Presser foot down means that the tension is engaged. Presser foot up means NO TENSION ON THE UPPER THREAD. Result? 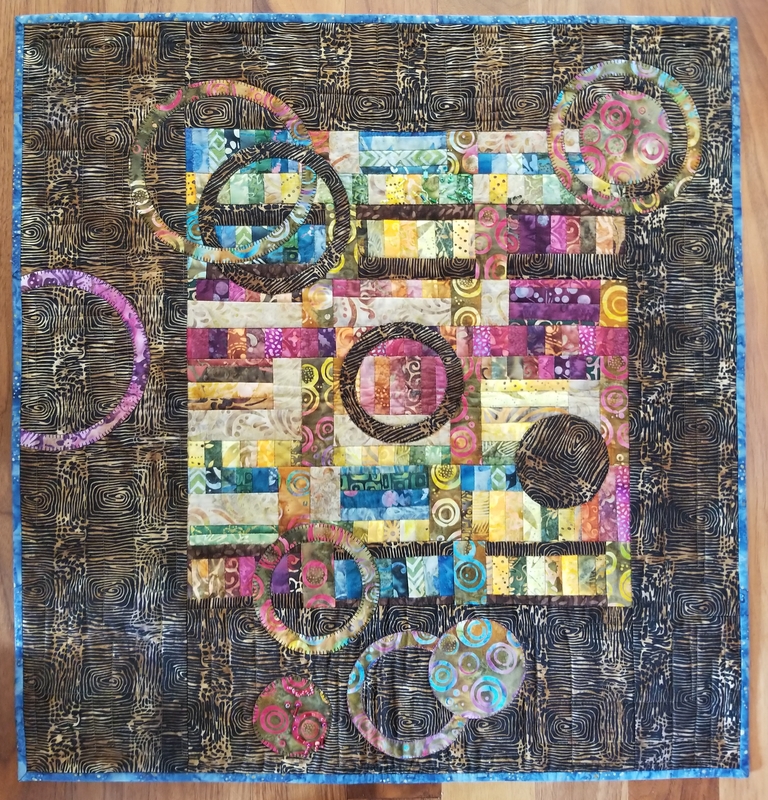 A big jumbled mess of TOP THREAD on the UNDERSIDE of your quilt. My tip, always give the presser foot lifter a quick stroke with your hand before you resume quilting, just to make sure it is down. 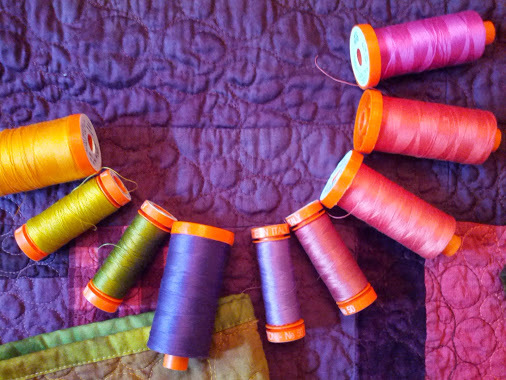 The 50 weight on the orange core is the #1 winner for the piecing of your quilt. It is so fine and strong and adds no bulk to the seam. This allows you to press your seams as flat as they can possibly be, adding to the accuracy of your piecing. Thank-you for coming to Carola’s Quilt Shop for our Trans-Canada Block Party Instruction and/or kit. Instructions are only available for pick up at Quilt Shops across Canada. They are free, enjoy your Canadian Quilt Shop tour! Below are a few pictures to help put your block together. Cheers!